Prior to the band, Kate had clocked up tens of millions of views on YouTube for her catalogue of covers. She released an album, had tracks played on Radio 2, and spent a summer in Los Angeles writing with various renowned hitmakers. Dan, meanwhile, was playing in various rock bands and earning a reputation as a great director having made videos with the likes of Don Broco, Lower Than Atlantis and Mallory Knox. But Kate was feeling drastically unfulfilled, worried she was only going to be known for covering other people’s songs when she had so many of her own waiting for an audience. Dan, meanwhile, musical tastes changing and growing all the time, was lumbered with bandmates that would neither shift their focus or gig further than 10 miles from home. Something had to give. 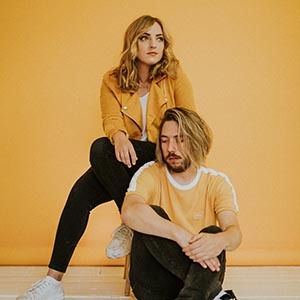 With both Dan and Kate hailing from Plymouth, a town with a relatively small music scene, it’s little surprise they already knew of each other.